The chief of the ruling Democratic Party expressed anticipation Wednesday that President Moon Jae-in's special envoy to North Korea could help bring peace to the Korean Peninsula amid impasses over the North's denuclearization. Earlier in the day, the five-member delegation led by national security advisor Chung Eui-yong arrived in Pyongyang for a trip aimed at fine-tuning details about a proposed third inter-Korean summit and moving forward stalled denuclearization talks. 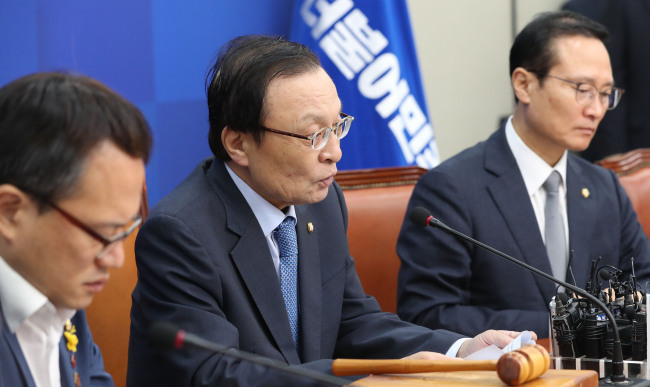 "We expect that the delegation's visit could pave the way for making progress in discussing issues of declaring an end to the 1950-53 Korean War and bringing peace to the peninsula," Lee Hae-chan, the chairman of the DP, said at a meeting with senior party officials. President Moon and North Korean leader Kim Jong-un are widely expected to hold their summit this month after their first meeting in April and another in May. "South Korea is a party to Korean Peninsula issues and also a mediator (in resolving the North's nuclear issue)," Lee said, adding that the DP will support Moon's peace efforts. Hong Young-pyo, the floor leader of the DP, called on parliamentary ratification of the April inter-Korean summit agreement. "I once again hope that the ruling and opposition parties could visit North Korea together when the third summit will be held," he said.